Children seek challenge and in Denmark they refer to that ‘knot in the stomach’ feeling as is i maven which translates to ‘ice in the stomach’. This is seen as a positive emotion and one that both children and adults seek. As we grow into adulthood, the skills we learn through risk taking are self confidence, emotional resilience, and the ability to self-assess risk situations. I believe there are situations where society has created a feeling of apprehension about nature; a fear culture that is beginning to pervade the world. In our disconnection from the natural world there has been an attempt to control nature, to create packaged experiences for children. This trend has been fuelled by some real restrictions and some misinterpreted boundaries that are imposed onto children’s play. We need to reflect on our expectations of children so that we can see them as capable, competent learners, not as something that needs to be wrapped in cotton wool. In the Nature Kindergartens in Scotland we have slopes, some of them steep: it is important that children feel the sensation of being in control of feeling ‘out of control’ as they run down them. We believe that too many restrictions takes away the learning moment. Our philosophy is to be hazard-aware and not risk-averse, and to employ a sense of perspective when assessing play-based situations. The adult role is to remove hazards that the children do not see, not the risk within the play. For example, unseen spikes or sticks in jumping areas. But it is not our role to remove the challenges that children see and choose to undertake. Children can choose to climb up a tree and decide how far they feel comfortable climbing. If we remove all challenges children lose the feeling of aspiration, which is so very important. Children develop a respect for danger, hazards and experimentation. If risks are managed constructively during the play process, then a “child’s desire to explore further” can be fuelled (O’Brien & Murray 2006). The best safety lies in learning how to deal with risk rather than simply avoiding it. A key point is that safety is the responsibility of all staff and children. No one person could possibly take it all on board and be effective. Children are encouraged to be their own risk assessors and they are good at it. In the Nature Kindergartens we offer and encourage ‘risky play’ with the adults scaffolding the activity while the children gain confidence and become more competent both in self-risk assessing and in mastering the activity. When discussing the possible risks of climbing trees, Jacob (4) stated, ‘only go as high as it doesn’t scare you’ while Francis (7) suggested ‘if you can climb up a tree you need to be able to get down’. For all the activities children undertake we do a benefit-risk analysis where we compare the risk of a situation to its related benefits. We believe that a benefit-risk assessment is not simply a technical matter but needs to be a value-based exercise which is dependent on the practitioner’s knowledge about children’s capacities, their resilience and their ability to make judgements. On my recent visit to Australia I observed some wonderful provisions of outdoor play. However, I also saw others that had artificial designs and safety surfaces, and where the space was too limiting and controlled to really challenge the children there. My work has always been to reconnect children to nature. Children are integral with nature irrespective of where they live. However, children that once would have sought out nature in their free time are curtailed, with their natural inclinations often redirected by adults to clubs and organised play. Children who live ‘second hand lives’ through received knowledge from an overreliance on digital technology and controlled events, will only be able to record a narrow aspect of the experience as defined by the adults, perhaps only a visual image of an event or place that should in fact be a multi-dimensional experience. We need to consider the emotional and intellectual limitations of environments that wrap children in cotton wool. Are they developing creative, dynamic people or behaviours of compliance and servitude? 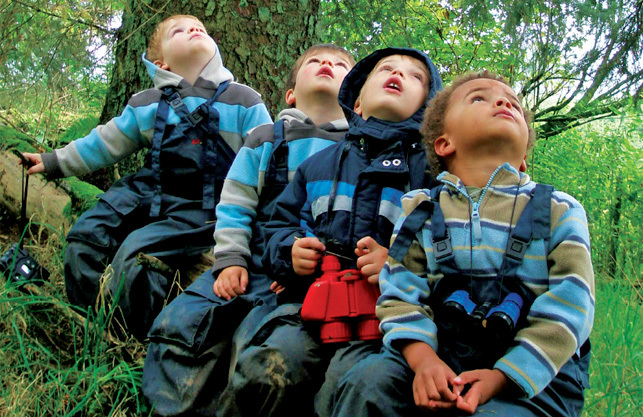 One of the strengths of the real world and more specifically, nature, is in the open-ended resources and limitless experiences that it offers to children. When given the opportunity, children verbally and physically demonstrate preference for, and enjoy playing in, natural environments and/or indoors with natural elements. The wealth of research shows that they do so because of the overwhelming play potential of such spaces: the possibilities of now and the promise of more to come. Children have the right to choose their own experiences and have the excitement of ‘more to come’, with all the risks and challenges it may present. Surely that is what life is all about!